Burgers with pulled meats are on trend across many pub and club menus. This recipe uses shredded chicken, seasoned with KNORR Concentrated Liquid Stock to bring moisture and flavour back into the cooked meat. 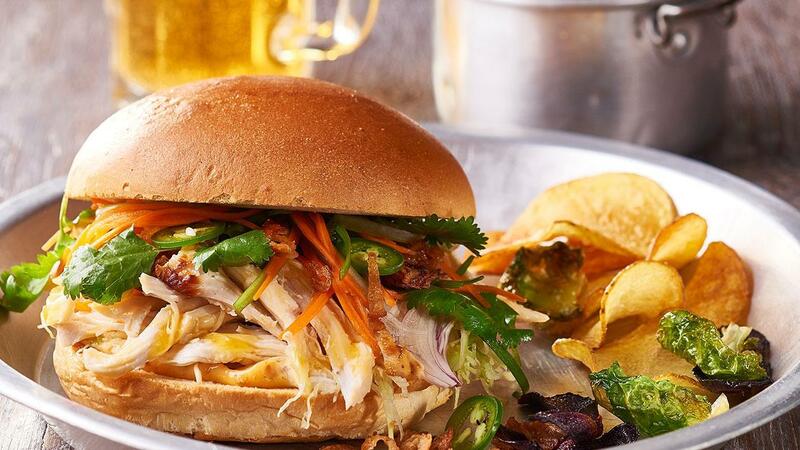 Served with a Vietnamese salad, it makes a delicious Asian-inspired chicken burger. Char grill chicken breast. Finish roasting in the oven until cooked through. Remove the skin and deep fry until crispy, chop into small pieces. Shred the chicken with a fork and add KNORR Concentrated Liquid Stock, set aside for use. Combine coriander, mint, shallots and carrots together, season with KNORR Lime Powder. Combine HELLMANN'S Real Mayonnaise and KNORR Thai Sweet Chilli Jam together. Grill the buns and add all ingredients, including lettuce and chopped chicken skin for crunch, serve with assorted vegetable crisps and lime salt.